Morning twilight sky on Thursday, January 31 looking east as seen from Adelaide at 5:32 ACDST (60 minutes before sunrise). 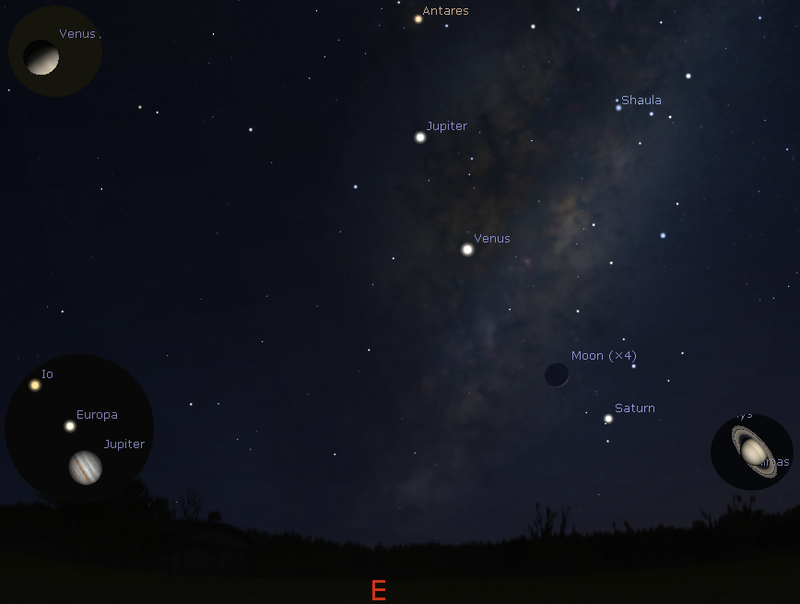 The thin crescent Moon is close to Jupiter. Venus is below Jupiter. Saturn is low to the horizon. The left upper insert inset shows the telescopic view of Venus at this time. 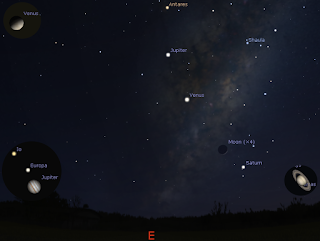 the lower left insert shows the telescopic view of Jupiter at the same scale and the lower right that of Saturn. 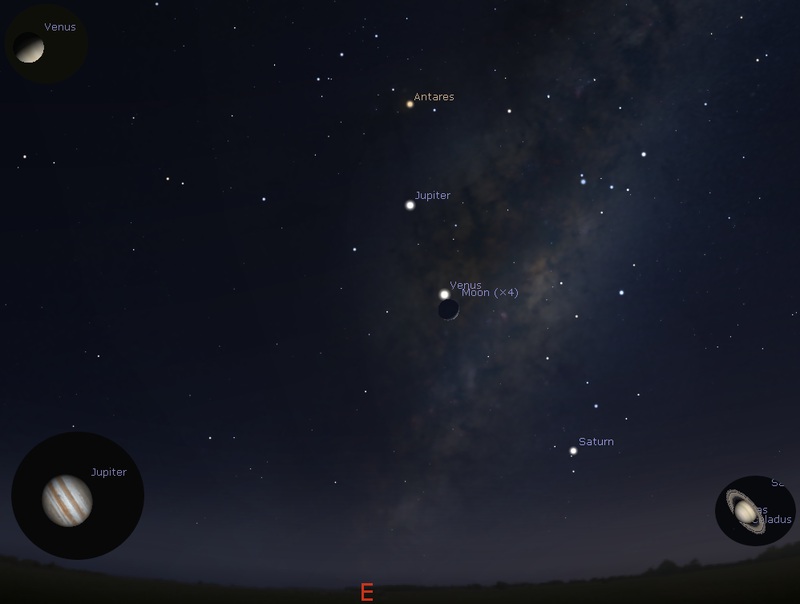 Similar views will be seen elsewhere in Australia at the equivalent local time (60 minutes before sunrise) Morning twilight sky on Friday, February 1 looking east as seen from Adelaide at 5:34 ACDST (60 minutes before sunrise). Venus is bright and is close to the crescent Moon. Jupiter is above Venus and Saturn below it. The left upper insert inset shows the telescopic view of Venus at this time. the lower left insert shows the telescopic view of Jupiter at the same scale and the lower right that of Saturn. 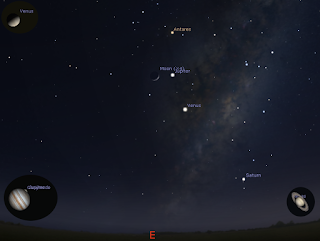 Similar views will be seen elsewhere in Australia at the equivalent local time (60 minutes before sunrise). Morning twilight sky on Saturday, February 2looking east as seen from Adelaide at 5:34 ACDST (60 minutes before sunrise). Venus is bright with Jupiter above it and Saturn below it. Saturn is close to the thin crescent Moon. The left upper insert inset shows the telescopic view of Venus at this time. the lower left insert shows the telescopic view of Jupiter at the same scale and the lower right that of Saturn. The astronomical action is in the morning sky over the next three mornings as the thin crescent Moon visits Jupiter, Venus and Saturn in turn. The 31st has a bonus of an occultation of Ganymede by Jupiter. 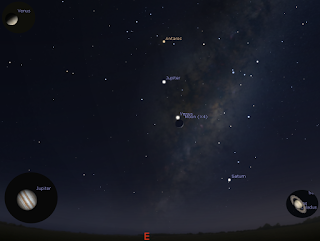 On the 2nd Venus can be seen in binoculars amongst some interesting clusters and nebulae.